Sometimes you meet people on Myspace. Nothing special. But sometimes someone adds you (or you add someone) that really has something to say, or in this case, something to play. Meet Trip Lava. Oddball in the Corner Pocket ; Psychedelic rock, or as the CD cover puts it: Experimental, improvised, instrumental rock, is not a music-genre you would usually expect on a blog like mine. But I take a lot of inspiration from different genre’s of music, especially indie rock music from Britain and the US. (I’m still thoroughly in love with 90’s grunge for example.) Once I started listening to the music I was hooked into the vibe. Listening to these tracks takes me back to The Chemical Brothers and James Holden‘s Border Community. The former doesn’t need explaining, but for the latter it’s the somewhat esoteric switches, glitches and samples used in the tracks. Think about the wailing guitar (-like) sound in Nathan Fake’s “The Sky was Pink” and you are one step closer to digging the sound of Trip Lava. After 44 minutes I was disappointed that the CD was over.. Which is, of course, a compliment as it makes you wanna hit play again. Lovers of experimental music should definitely check this out, and lovers of other genre’s could take inspiration or maybe even samples from works like these. (But don’t forget to clear samples before use!) An all round cool CD. 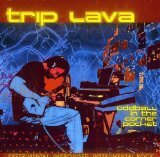 Trip Lava was so nice to send me his CD so I could listen & review it. Add him on Myspace and tell him how you feel about his tracks. Your thoughts are appreciated, so don’t be shy!